Alfa Romeo 4C Forums > Alfa Romeo 4C Forums > Alfa Romeo 4C General Discussion > Anyone Own a Stelvio Quad or Giulia Quad? 21 seconds separate the Giulia Q and Stelvio Q's B2G times. That's pretty stellar considering the extra weight. Both are fastest in their class, and faster than the 4C. But as said, we don't commute on the Nurburgring. Pity! Still, it's cool that regardless of whether you are a sedan person or an SUV person, Alfa has a class-leading performance option for you to consider. Beyond that, it's all personal preference. Both are fastest in their class, and faster than the 4C on the Nurburgring. 4Canada and mc3456 like this. Anyone Own a Stelvio Quad or Giulia Quad? If both cars are stock it’s about a draw. On a tighter course the 4C probably would be a little faster just like you say. If both cars were modded the 4C is a lot faster. Giulia QV is just too heavy but it’s still quite fast compared to its similar weight competitors. The Camero ZL1 1LE with 650hp at approximately $70,000 car is a little faster than Giulia QV mostly because it has adjustable negative camber. The Giulia QV does not have that and is only -.5 front camber. But I’m working on that mod. Then it would be about a tie. FYI the ZL1 1LE amazingly can run up to -3.7 front camber. That’s about the same as a Formula One car! A friend of mine owns one of these cars and only gets about one track day out of a set of those big 305/30/19 front tires. 4Canada and BostonDMD like this. 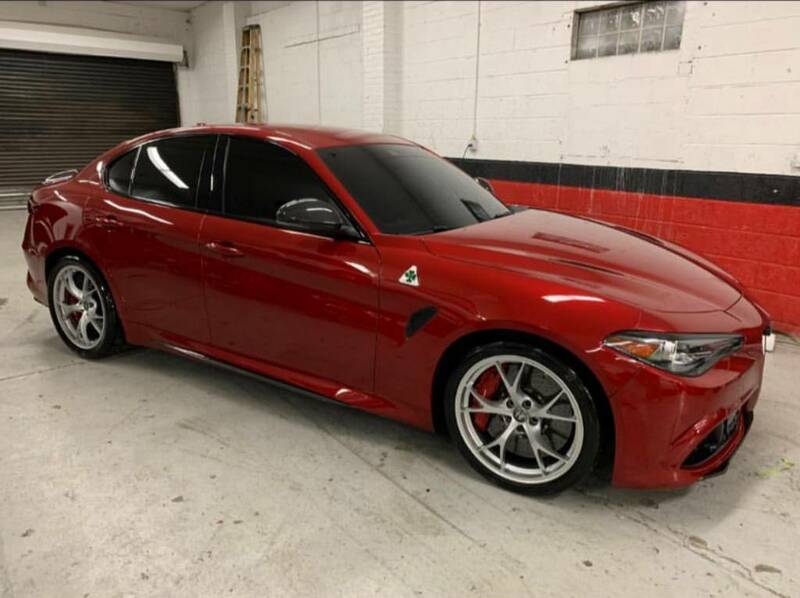 Should I buy a Giulia Quadrifoglio? I drove both cars yesterday , the 4c is raw and beautiful but honestly the quad would blow the doors off of it , if only i could be in both cars at the same time . HMMM, If 4C was the pitcher and Giulia the catcher, I wonder what you get????? 8C or maybe a 6C. Unless they are fudgepacking, no offspring. "One take" performance = giulia quad all day. If lapping for any substantial period of time = the 4C would demolish it. If in a "race" (e.g., laps) = the 4C would obliterate it. This is obvious because if both are driven in anger the 4C's massive weight advantage and fuel efficiency advantage would overcome the slight acceleration advantage in the Giulia. But for a street pull or a limited number of hot laps, you can't overcome the power disadvantage since the power/weight ratio is better in the quad. Both awesome cars but imho they aren't at all comparable. Last edited by DetroitDave; 04-05-2019 at 03:10 PM. That was a great buy! Wow! 0-60 times are close after that the Giulia QV pulls away and keeps going. On turns stock cars at about the same, slight edge to the 4C. Visceral driving feeling 4C has it but the Giulia QV has it’s own madman feeling for sure. Giulia QV is bigger and gets the bigger traffic tickets! Lol. Yes 100mph comes real fast but 137mph yikes you might spend the night in the pokey. They put salt on the roads where I live so I don’t like driving a nice Alfa car with nice alloy wheels in the snow. I have a 4wheel drive truck for that. My wife has a Merc SUV she drives in the winter but we have winter rims and tires for it. Our Mercedes dealership even stores them for us. If we switch the Merc for the Stelvio that is what I would do with the wheels also. Giulia accessories, get the LED door lights that shine the Alfa logo on the ground and also the carbon fiber door sill led lights. Nice inexpensive mods that add quite a bit at night. See you got the CCB brakes. If you just street drive it only they will last a very long time. But if you track it beware at $1,300 per set of brake pads either front or rear it’s expensive! Only two maybe three full hard track days per set of front brake pads. And the rotors only go through about 6 sets before you need to replace because they are too underweight. I’ve had to replace my rotors already but i’ve tracked the car quite a bit and had a lot of fun. But there is a tracking solution for cars that have the CCB brakes. As I type this my car is getting the new Girodisc steel brake conversion kit scheduled to be put on my car. Actually I’m getting the first prototype as they’re still working through a few things I am helping them with. With brake pads that will cost about $400 instead of $1,300 it’s a good solution. I’m also believing they’re going to last longer as the CCB rotors turned into cheese graders the more sets of pads you go through. When It’s all done I’ll post something in the Giulia forum and something here too. Nimo and lars like this.